Meet the Targus USB-C™ Universal Quad HD Docking Station (DOCK520USZ), the world’s first docking station to deliver four HD extended displays and now a CES® 2019 Innovation Awards Honoree. 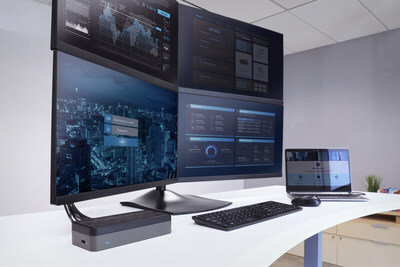 ANAHEIM, Calif., Nov. 8, 2018 /PRNewswire/ -- Targus, the industry leader that introduced the first universal dual-video docking station, announced today that its USB-C™ Universal Quad Video HD Docking Station (DOCK520USZ) has been selected as a CES 2019 Innovation Awards Honoree in the Computer Peripherals category. Revealed today at CES Unveiled in NY, this award-winning dock will be displayed at the CES Innovation Awards Showcase during CES 2019 in Las Vegas. Targus will also be showcasing its honored Universal Quad Video HD Docking Station along with other next generation docking solutions and accessories throughout the show starting with CES Unveiled on Sunday, January 6 and continuing at its booth (LVCC, South Hall, Booth #31147). The DOCK520USZ gives call centers, investment firms, design agencies, and IT departments the ability to connect a laptop to up to four monitors via (4) HDMI video out ports. Outfitted with Dual DisplayLink® DL-3950 chip technology, the dock supports four HD (1920 x 1080 p60) displays or one 2K (2560 x 1440 p50) display. The docking station includes additional ports to connect essential USB 3.0 peripherals and to an Ethernet network. It has a compact and low-profile, consuming half the desk space of typical docks. Wide compatibility with virtually any laptop ensures easy deployment and use with Thunderbolt 3™, Display Port Alt-Mode, and USB 3.0, 3.1 and Type-C devices. "We're honored to be recognized with an Innovation Award for our new quad-display docking station," says Andrew Corkill, Vice President of Marketing & Channel Management at Targus. "It's the industry's first universal docking station to support four HD extended displays - reaffirming Targus as a true innovator for individuals who want to see and do more while they work. We are thrilled to be showcasing this product achievement at CES along with other revolutionary product innovations in our pipeline." The USB-C™ Universal Quad Video HD Docking Station will be available through authorized resellers and at targus.com this holiday season. Headquartered in Anaheim, California, Targus has global operations in over 45 offices and distribution in more than 100 countries. Learn more about us at targus.com, like or follow us at facebook.com/targus and linkedin.com/targus. CES Innovation Awards are granted to new consumer technology products that enable, enhance, and connect computer systems across 28 categories. Entries are on the products' innovation in design, engineering, and user value. For more information on CES and the Innovation Awards visit ces.tech/Events-Programs/Innovation-Awards.aspx.